- Just notice for 3 days how often you are pulled away from the present moment in story, distraction, running a to do list mentally in the background. Don't bother changing the behavior, just notice how often you live in another time or dimension. 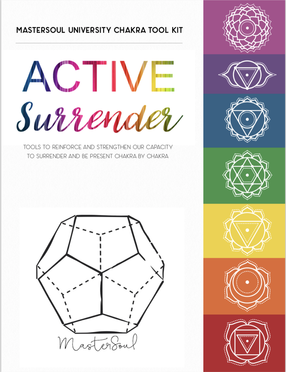 ​- Spend a week with each chakra and clear it out, dive deep into the stories, notice where they are specifically feeling strong and play with the chakra kits to strengthen your senses. - Set an alarm throughout the day and do the breathing / be here now exercise to refocus and recenter yourself in this moment. -Try eating mindfully for one week, doing nothing else but eating each bite 33 times. Check in with your body before you eat and while your eating. Is this what I'm craving? Am I hungry or full? How is this making me feel? Notice what comes up for you when you practice being fully present with something so physical. -Set up reminders on your phone to pop up and ask 'am I here now'? I have consciously made it available to everyone who is called to the work. ​please consider making a contribution by clicking the image below. I'm would be thrilled to know that you enjoyed this course. If you're choosing to reciprocate financially please note that 50% of whatever you choose to invest in this program will be reinvested in a cause or charity of my choosing or will be paid forward in the form of a scholarship for another soul seeker. Click the PayPay link and do your thing.